A pair of French-made, World War II-era semi-automatic rifles sold as single lots for a combined $4,625 at a Military, Firearm & Weapon Auction held May 5th by Bruneau & Co. Auctioneers, online and at the firm's gallery in Cranston, Rhode Island. World War II Japanese Marines Type 90 combat helmet, kept as a trophy ($1,750). CRANSTON, R.I. - May 10, 2018 - PRLog -- A pair of French-made, World War II-era semi-automatic rifles sold as single lots for a combined $4,625 at a Military, Firearm & Weapon Auction held May 5th by Bruneau & Co. Auctioneers, online and at the firm's Cranston gallery. The sale was locked and loaded with 781 lots that spanned multiple generations and conflicts. Bidding was brisk all day. "This sale was a ton of fun to organize and brought in a large group of new customers," said Kevin Bruneau, the president and auctioneer of Bruneau & Co. Auctioneers. "Even being a seven-hour day, the crowd stayed with us all the way to the end. It went off without a hitch." Travis Landry, a Bruneau & Co. specialist and auctioneer, added, "It was a long day but it was definitely worth it. It was a thrill to see some collectors travel from as far away as South Carolina to be here in person. It was a great day, with strong results all around, in all major categories." The French World War II rifles were both MAS Mle models, of which only 7,000 were produced between 1944 and 1945. Both guns measured 42 ½ inches in length and had one magazine each. One was very clean and evidently saw very little use; it hit the mark for $2,500. The other rifle had been issued and used but was in good condition and so finished for a little bit less, at $2,125. Following are additional highlights from the sale. Online bidding was via LiveAuctioneers.com, Bidlive.Bruneauandco.com, Invaluable.com and Bidsquare.com. All prices quoted include the buyer's premium. Two weapons made over 100 years apart sold for identical prices of $1,375. The older lot was a U.S. Civil War Cavalry sword, produced around 1864 and engraved "Henry Boker Solingen". The sword was German-made, an export weapon meant for the American market and purchased for use in the American Civil War. The blade was 34 ½ inches long; overall it was 42 ½ inches. The newer, modern-day piece was a Colt model AR-15 A2 HBAR Sporter rifle, manufactured in the United States in 1978 and in very good condition, with only some light discoloration to the stock. The rifle, complete with eight magazines, was serial #SP 224976, 39 ½ inches in length. Two other 20th century rifles also piqued bidder interest. The first was a Springfield M-14 M1A weapon, made circa 1959-1960, 44 ½ inches long with four magazines and a Springfield Armory carrying case ($1,500). The second was a World War II, U.S.-made M1 Winchester Garand rifle, 43 ½ inches long and manufactured in 1943, very clean and in near-issued condition ($2,520). World War II seems to hold a never-ending source of fascination for collectors, as was evidenced by the fact that many of the sale's top lots were related to the conflict. Even a photo of German leader Adolph Hitler, signed by him with a sentiment and taken sometime between 1933 and 1939 by Heinrich Hoffman, Hitler's official photographer, unframed, did well, hitting $1,750. An impressive World War II U.S. Marine Corps uniform rig – consisting of a helmet with liner and camouflage cover, two-piece 1943 pattern uniform with stenciling to the back of the shirt, boots in near-mint condition, ammo belt marked "USMC", a "PAL" marked bayonet, first aid packet and cross strap canteen hooked on, and even a mannequin to wear it all – made $2,000. 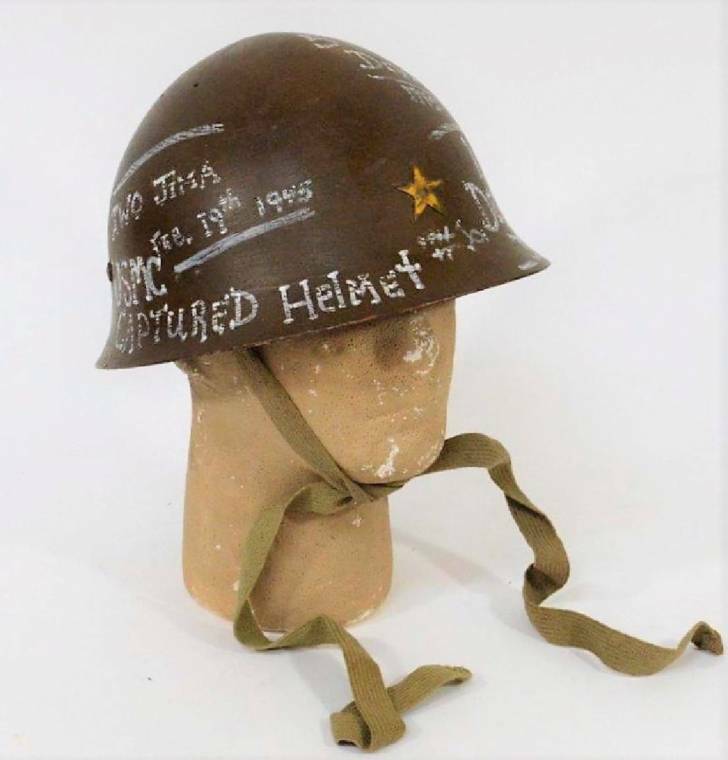 A World War II Japanese Marines Type 90 combat helmet, kept as a trophy and brought back to the States by the Marine who captured it and painted a sentiment on the outside, changed hands for $1,750. The helmet, from around 1938-1945, was made for the Japanese Marine or Naval Landing Forces. Japanese characters were painted on the inside, by the helmet's original owner. A very rare complete boxed set of German Navy ships, used by the U.S. Navy during World War II and assembled in 1942, knocked down for $1,375. Each of the thirty German ships that were known at the time was identified. The ship models came housed in the original wooden case and the set's condition was very good, possibly never used. Its only flaw was some paint flaking off. To learn more about Bruneau & Co. Auctioneers and the firm's calendar of upcoming events, visit www.bruneauandco.com. To contact Bruneau & Co. Auctioneers, you may call them at (401) 533-9980; or, you can send them an e-mail, to info@bruneauandco.com. The firm is always seeking quality consignment for future auctions, in a wide array of collecting categories.